FORCES OF VALOR 80080 GERMAN KFZ 70 PERSONNEL CARRIER The "Krupp-Protze" was a six-wheeled German truck and artillery tractor used by German forces in WW II. It was powered by a 55 hp or 60 hp (since 1936) Krupp M 304 4-cylinder petrol engine. Its main purpose was to tow artillery, and transport motorized infantry. 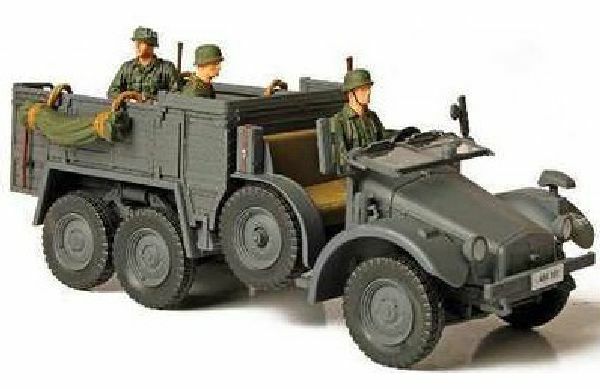 Comes with a driver figure and two soldiers. The "Krupp-Protze" was a six-wheeled German truck and artillery tractor used by German forces in WW II. It was powered by a 55 hp or 60 hp (since 1936) Krupp M 304 4-cylinder petrol engine. Its main purpose was to tow artillery, and transport motorized infantry. This vehicle was extensively used on the Eastern Front, North African campaign and in France and Sicily. The "Krupp-Protze" was of relatively advanced design. It was mass-manufactured between 1933 and 1941. Its fuel consumption was relatively high (24 Litres / 100 km on road). Total production was about 7,000 units. The Forces of Valor replica® is of a Kfz. 70 as seen on the Eastern Front in 1941.